The tradeoff between the capacity to upload and the possibility to download goes to the heart of the battle between active creation and passive consumption. Today it is clear that the digital divide will be about whether access translates into sophisticated usage. 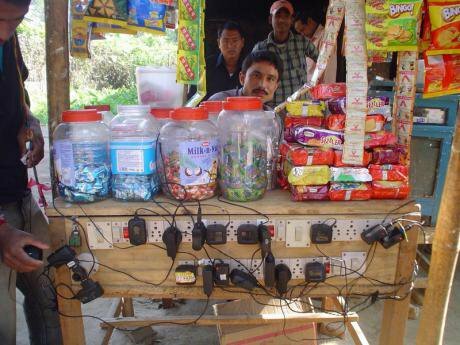 A shopkeeper charging mobile phones in the village of Gohpur, Assam in India. Demotix/Abdul Sajid. All rights reserved. The year 2013 was a turning point for the internet’s centre of gravity. For the first time in the internet’s history, there are as many internet-connected mobile devices, such as smartphones and tablets, as desktop and laptop personal computers (PCs). And there are as many mobile devices as the number of people on earth. In many countries, mobile broadband is complementing fixed broadband, and in certain segments replacing it. This great advance in connectivity will empower billions more individuals, especially those from developing countries, to instantaneously produce and transmit information across the globe. There is no question that the mobile internet will fuel and reshape digital content production. Yet we must also note its inherent limitations and set our sight on bridging the digital divide beyond providing mobile access. Only by doing so can we ensure that all have equal opportunities to make full use of what’s possible with the internet for content creation and distribution. The shift to the mobile internet is set to accelerate fast in the foreseeable future. Figures from Ericsson show that global mobile broadband subscriptions passed 2 billion in 2013, and will grow 4 times by 2019, reaching 8 billion. According to Cisco, global mobile data traffic will increase 13-fold between 2012 and 2017. This is equivalent to a year-on-year growth rate of 66%, and mobile data traffic will reach 11.2 exabytes per month by 2017. The mobile internet will herald a new age of global connectivity. Today, there are still 4.4 billion people who are not connected to the internet. But almost all live within reach of a mobile-cellular signal, and half of the world’s population is covered by a 3G network, which is necessary to provide high-speed access to the internet. As networks are being upgraded and affordable mobile devices proliferate, mobile broadband will provide an economic way for the vast majority of people in developing countries to connect to the internet. Indeed, some of today’s most promising internet applications evolve from the mobile ecosystem in emerging markets. The increasing number of first-time smartphone users in Asia is fuelling the rapid growth of Line and WeChat, two well-known mobile applications combining instant messaging with social networks. Japan’s Line has more than 250 million users worldwide, with 80% of them outside Japan, while China’s WeChat boosts 300 million users in the country and 100 million overseas. This unprecedented access will reshape global access to information and enhance the communicative power of individuals and communities. The ease with which many more users can create text, sound, images and videos through mobile devices will fuel the continued explosion of online content. While we celebrate these socio-economic opportunities, to what extent could the phenomenon of user-generated content be reshaped as more people use smartphones and mobile broadband, instead of PCs and fixed connections? The user experience will greatly influence the propensity to create content, and the depth of interaction. First, it is important to recognise that mobile technologies do not replace fixed technologies for intensive, high-end use. Fixed broadband is often of a higher and more consistent speed, and with less latency. Moreover, fibre, one of the main broadband technologies, can offer symmetrical upload and download speeds, whereas other technologies like mobile are predominantly asymmetric, with higher download speeds. Despite the relentless push to mobility and ubiquity, inherent limitations in mobile devices will prevent users from fully utilising the potential of the more interactive aspects of digital media. As Nietzsche famously said, “our writing instruments contribute to our thoughts.” In The Secret War Between Downloading and Uploading, UCLA Professor Peter Lunenfeld asserts that by sacrificing desktops and fully featured laptops for thin client mobile devices, we forego the huge potential of the computer as a culture machine for the twenty-first century. While there are benefits to the culture machine of the ubiquity and downsizing, “as keyboards, screens, and even lenses get smaller and smaller, discourse tends to revert to the text-messaging level.” The tradeoff between the capacity to upload and the possibility to download goes to the heart of the battle between active creation and passive consumption. It is perhaps not a coincidence that the most popular internet applications in developing countries, like Line and WeChat, are often just mobile instant messaging. Developing deeper forms of interactive relationship between users and social media platforms is important to create a more vibrant ecosystem benefiting peoples, cultures and companies. In fact, born-digital media and industries, such as websites, social networks, and computer games, thrive because they are explicitly designed to be customised by users. Social media companies like Facebook, Flickr and Twitter encourage others not only to create content, but also to write applications which mashup data and add new services. It is harnessing the power of networks and the creativity of people who constitute them that the internet is at its strongest. Thanks to the advances in access, local language content has exploded over the past few years, and this trend will continue. However, much remains to be done to increase end-user familiarity with this opportunity, and to improve the quality of connections and devices. Strong co-operation and dialogue between governments, businesses and users are crucial to ensure that communities can express themselves effectively online. According to estimates from the International Telecommunication Union (ITU), the fixed broadband divide between developed and developing countries remains substantial. By end 2013, fixed broadband penetration stands at 27% and 6% among the two groups of countries respectively. In the least developed countries (LDCs), the total number of fixed broadband subscriptions was only 1.3 million, or just 0.2 per 100 people. Looking at the production of the world’s knowledge, it is apparent that a two-tiered system, whereby key developed countries contribute to online content while others remain mere consumers, is emerging on the internet. According to Convoco and the Oxford Internet Institute, the United States, Europe and Japan account for the bulk of the world’s content (90%), as defined by the amount of user-generated content indexed by Google. Furthermore, Europe and North America are home to 84% of all articles in Wikipedia. Research has also shown that of the approximately 7,000 languages spoken today, only less than 5% can ascend to the digital realm, which requires use in a broad variety of digital contexts. Unsurprisingly, the most digitally thriving languages, such as English, Japanese, French, German and Chinese, are from economically vital countries. All this is not to discount the potential of the mobile internet. Enabling everyone on earth to access all of the world’s information through a device held in one’s hand is a remarkable achievement by any account. Widespread use of mobile phones will present exciting opportunities for people in developing countries, in areas like disaster relief, aid distribution, health, and money transfer. But we should not stop here. Improving the infrastructure and digital literacy to enhance people’s creative pursuits and abilities beyond providing technological access will be the next frontier in bridging the digital divide.